you stop for photos . . . which you'll definitely want to do!" 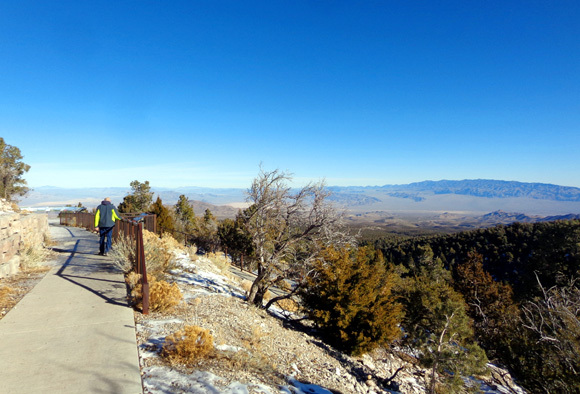 Las Vegas is surrounded by several mountain ranges. 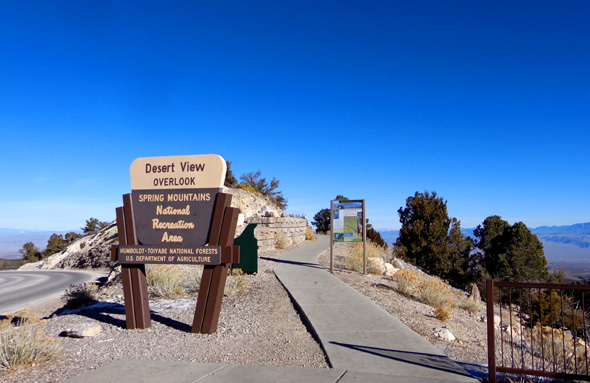 The Spring Mountains rise up from the desert on the west side of the metro area and include 11,811-foot Charleston Peak, the high-altitude town of Mt. 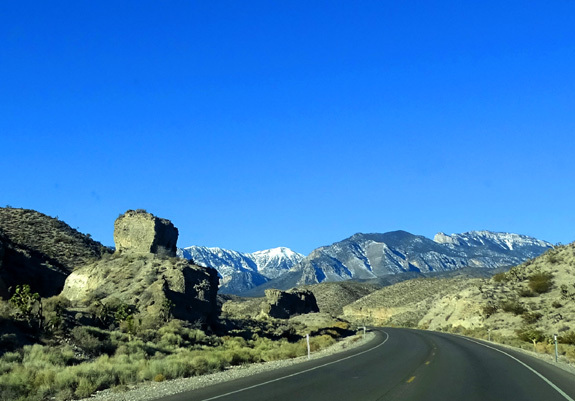 Charleston, the Tolyabe National Forest, Spring Mountains National Recreation Area, Spring Mountains Ranch State Park, and Red Rock National Conservation Area. 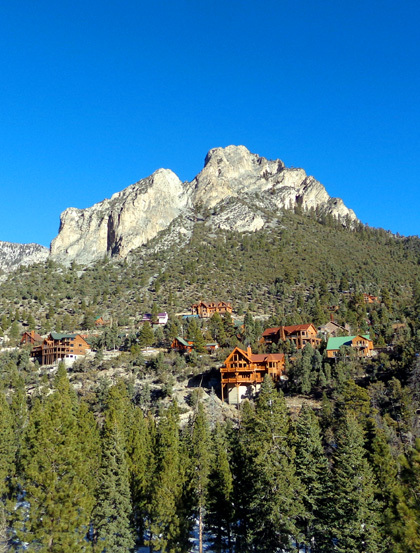 Charleston Peak is in the background, its summit covered in snow. 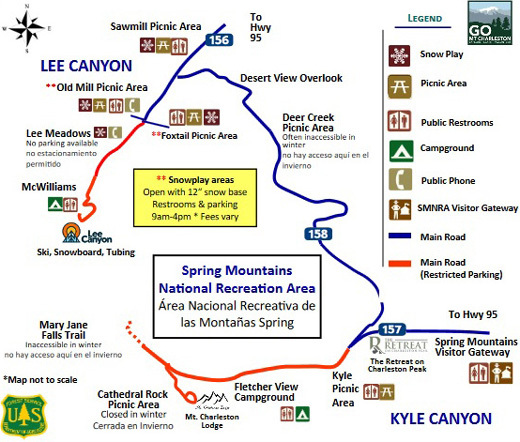 The Spring Mountains National Recreation Area, which we drove through today, is a popular venue year-round for sight-seeing, hiking, cycling, rock climbing, horseback riding, camping, skiing and other winter sports, watching birds and other wildlife, nature and scenic photography, picnicking, and other outdoor activities. 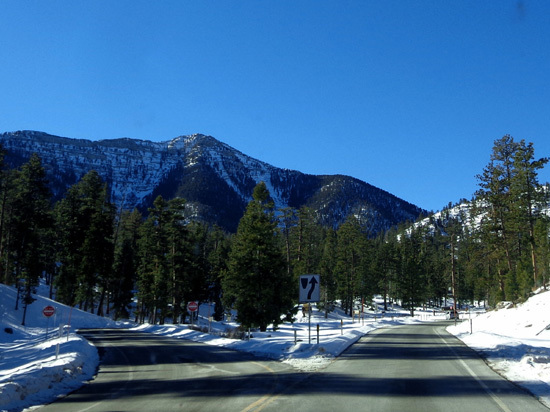 Today there was snow above 7,000 feet elevation but the roadways were all clear. 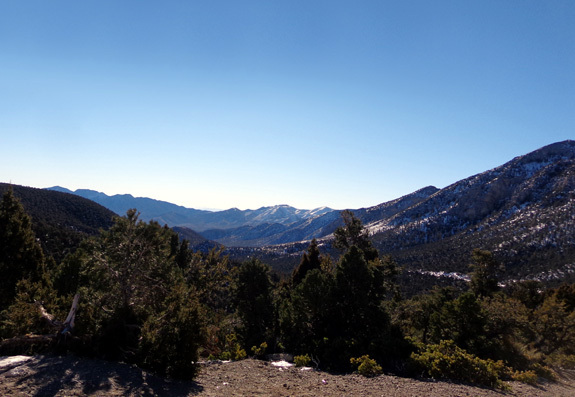 We made a big loop in the mountains with two shorter out-and-backs at the higher elevations of the loop. 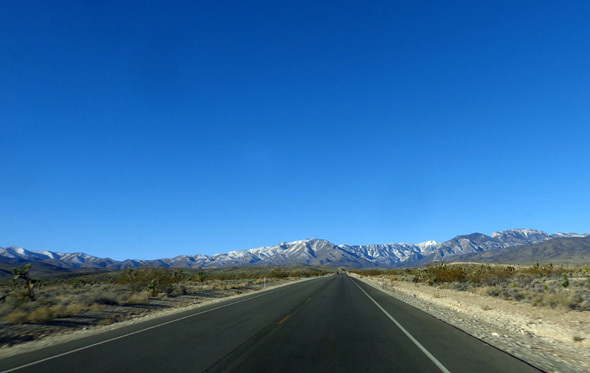 We drove north of Vegas on US 95 to NV 157. 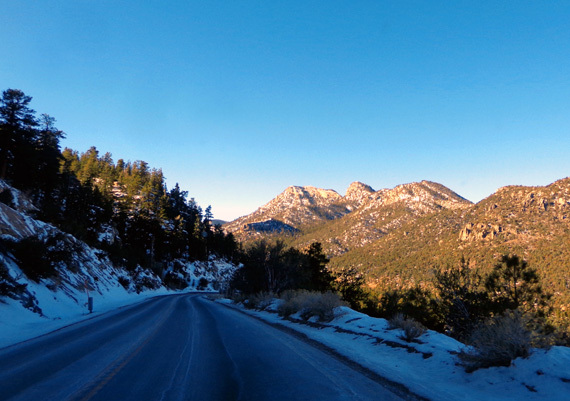 This wide two-lane paved road goes up into the mountains to the town of Mt. Charleston. 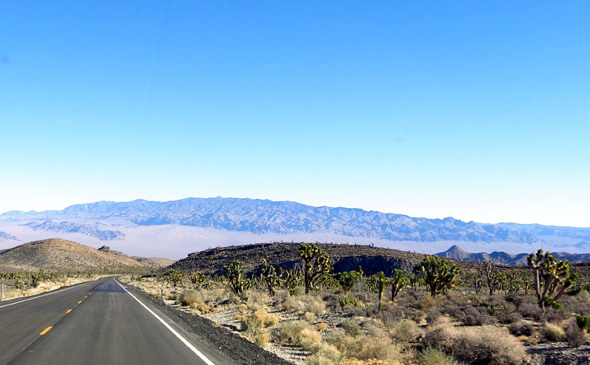 Above and below: There are Joshua trees between 4,000-5,000 feet elevation. 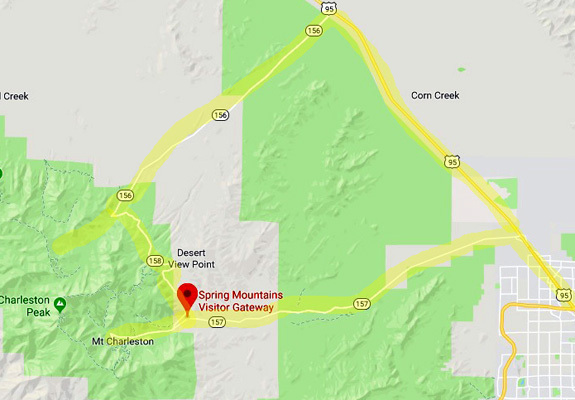 Just past the boundary for the recreation area we passed the Spring Mountains Visitor Gateway, a 90-acre complex that includes a visitor center, education building, amphitheaters, picnic areas, and trailheads. Unfortunately, because of the partial government shutdown this whole area was gated off. 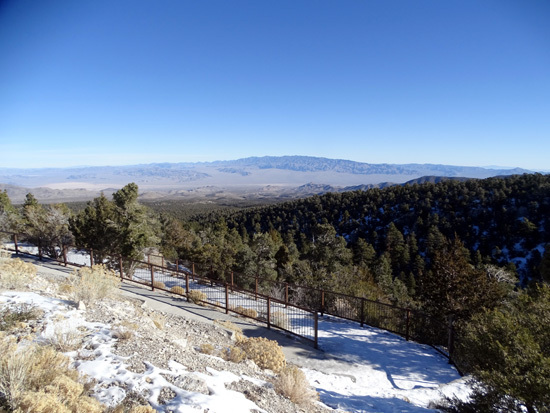 The recreation area itself was open but campgrounds and restrooms along the way were also closed. We just kept driving, curious as to what lay ahead and determined to see as much as we could. 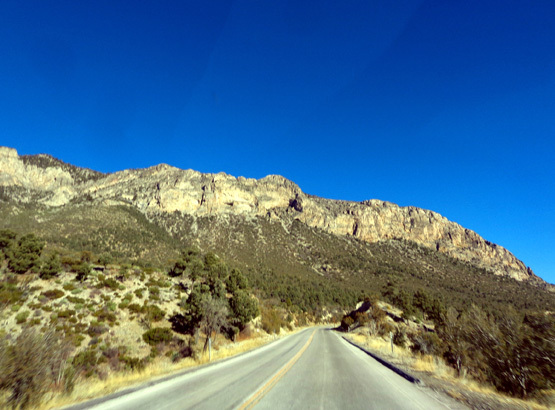 We continued west on NV 157 past the Kyle picnic area and Fletcher View Campground to the little town of Mt. Charleston. 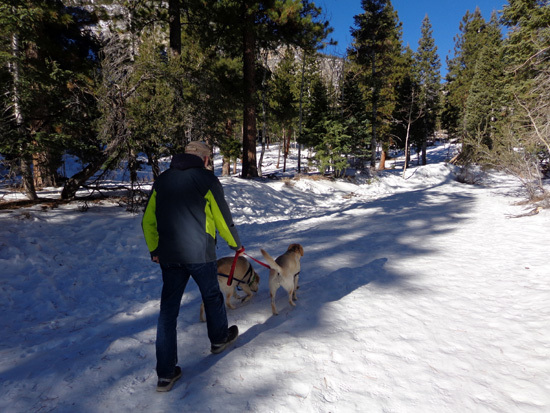 Since we didn't have to shovel the snow, we enjoyed seeing it and searched for places where we could let the dogs run in soft, fluffy white stuff. That was a pretty short hike of only half a mile. 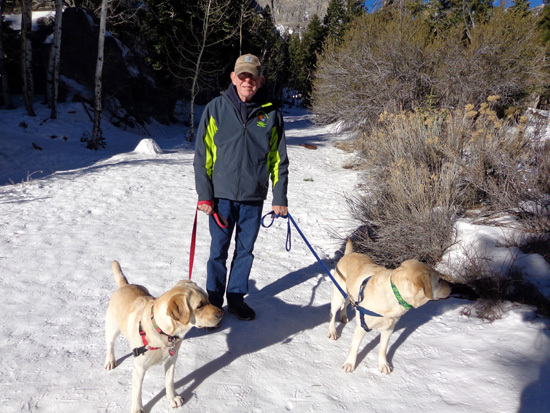 It would have been more fun for Casey and Holly off-leash but there were other people around so we kept them leashed. They can be a little too friendly sometimes! Those would be nice when it's hot, hot, hot down in the desert. 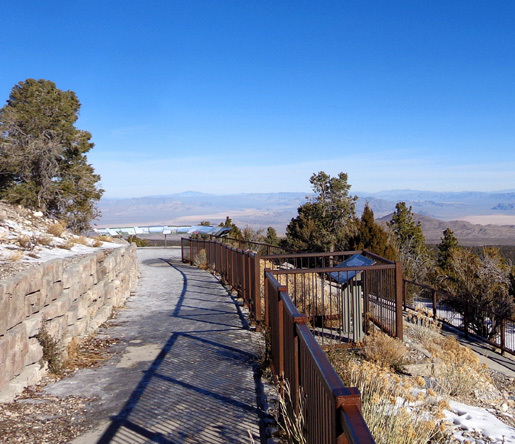 This wheelchair-accessible paved path zig-zags down the slope and is 3/4 mile long round trip. 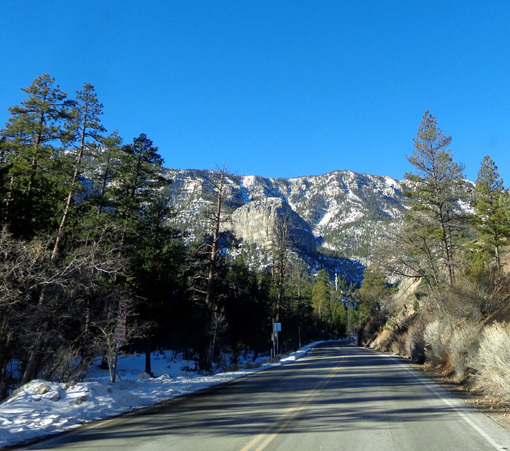 When we came to the intersection with NV 156 we turned left and followed it southwest past the Old Mill and Foxtail picnic areas, which were snowed in and closed, to the "snow-play areas" in Lee Meadows and Lee Canyon. 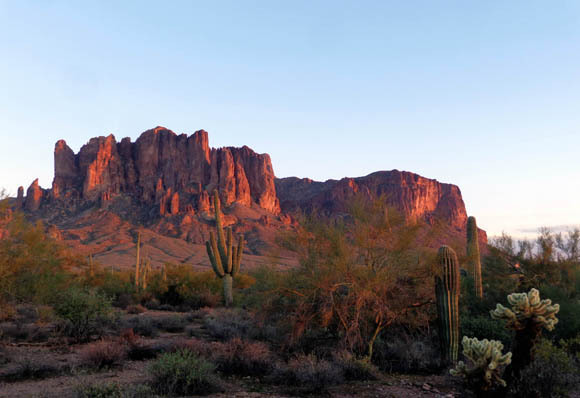 this view faces the Cactus Mountain Range and a USAF testing site to the east. 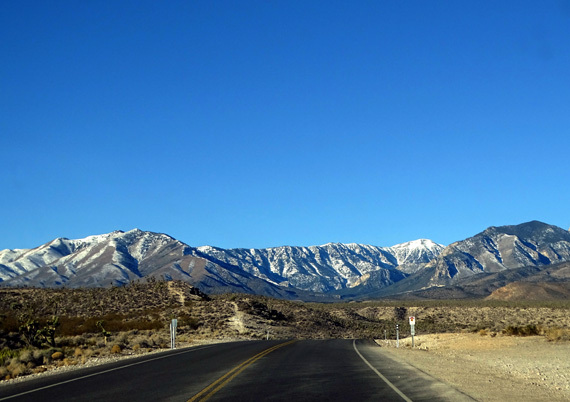 At the end of NV 156 we turned south on US 95 and drove back to the city. 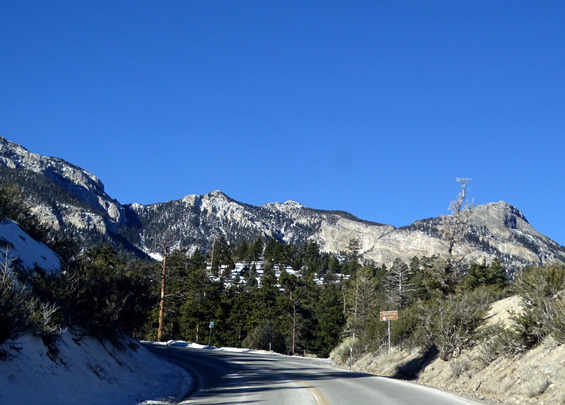 This was an interesting day drive in the winter since we'd never been up there before but we'd have more fun hiking when there isn't any snow. I'm sorry we couldn't see the visitor center; it was closed because of the partial government shutdown. 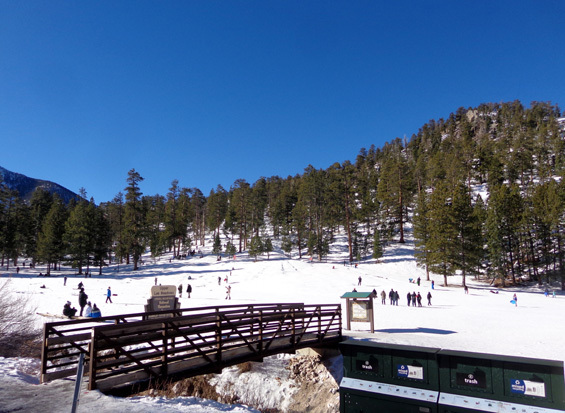 It appears there is a good variety of activities to do year-round in the recreation area when everything is open.